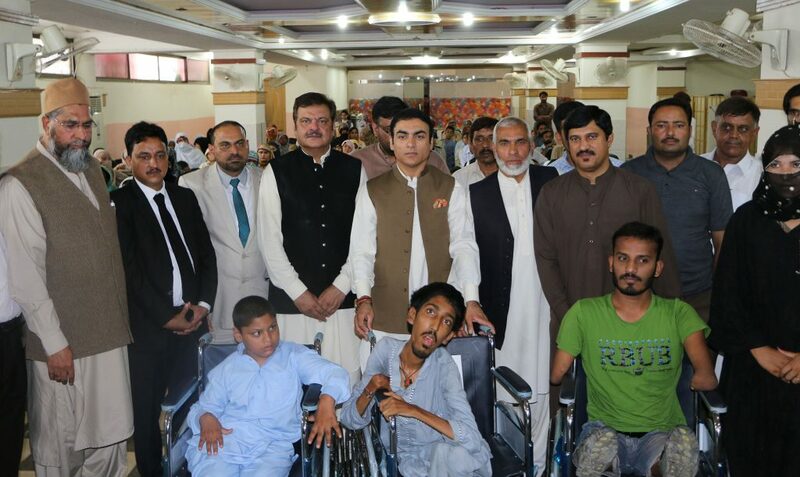 RAWALPINDI: The Pakistan Red Crescent (PRC) on Monday distributed wheelchairs, sewing machines and ration among the deserving people during a ceremony organized in Chaklala Scheme-III under the auspices of Human Helpline. Chairman PRC Dr. Saeed Elahi was the chief guest. Dr. Saeed distributed 20 wheelchairs and ration among 100 deserving people. Chairman Human Helpline Naeem Abbasi, Assistant Commissioner Rawalpindi Tasneem Ali Khan, Professor Majeed Hazarvi, Coordinator PRC Sheikh Hameed, Mr. Altaf of Social Welfare Department and others attended the ceremony. Addressing the ceremony, Dr. Saeed said it was a matter of immense joy and satisfaction for the Pakistani nation that the hearts of expatriates beat for them. He said the most important thing for a human being was to serve the humanity and the Human Helpline deserved praise and appreciation for serving the humanity. He assured the Helpline of the PRC’s help and cooperation in its efforts to reach out to those deriving help the most. Naeem Abbasi informed the participants about the aims and objectives of the Helpline and said their sole mission was to serve the humanity. He said their doors will always remain open for the poor people.